While nearly all Murugan devotees are familiar with images of the deity holding his Vel (or spear), many remain unaware of the profound significance of this symbology. In this paper I have sketched in simplified form the basic events surrounding the bestowal of the Vel, and the implications for the spiritual unfoldment of the individual devotee. While, as we know, this Divine Son bears many names, unless otherwise indicated I have used the generic term Murugan thoughout this account. The mythology of Murugan has its origins in the separation of Siva from his consort Uma. This occurred as a result of an incident during Siva's wedding to Uma. Siva had agreed to marry Uma, who had been incarnated as the daughter of Daksha (regarded as one of the forefathers of humankind), but had unexpectedly vanished during the nuptials. He subsequently carried Uma away as his bride. Incensed, Daksha convened a great sacrifice to which he invited all the gods, with the exception of Siva, about whom he spoke rudely. Taking the form of Virabhadra (Divine Anger), Siva appeared during the ritual, destroyed the sacrifice, humiliated all the gods present, and slew Daksha. Uma then advised Siva that she hated her current incarnation, for as long as she inhabited her present body she would be known as the daughter of Daksha, he who had cursed Siva, the supreme God. 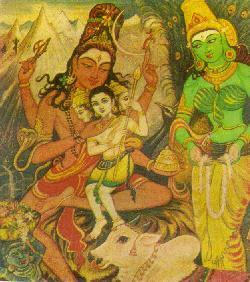 Siva instructed Uma to become reincarnated as the daughter of Himalaya, the Mountain Lord. She accordingly departed from Siva, and as Parvati performed great tapas (austerities) to purify herself and make herself attractive to Siva as her groom. Left without Uma, Siva secluded himself from daily life to devote himself to tapas and meditation. Before his withdrawal, however, he granted boons to three asuras (demons, or lower astral beings), namely Surapadman, Singhamukhan and Tarakasuran, including the extraordinary boon to Surapadman that he would live forever, would never be killed, and would rule most of the worlds. Obtaining these boons formed an integral part of a long-term asuric strategy to gain control of the universe. This plan had its origins in the birth of a daughter Surasai to Atisuran (also known as Akhiresa), the king of the asuras. From her early childhood Surasai was trained in the arts of maya (illusion). She became thoroughly proficient in all these arts, and thus became known as Mayai. To further the plans of the asuras, Mayai transformed herself into a beautiful woman who would beguile Kashyapar a well-known and powerful rishi (sage). She was to marry and have children with Kashyapar, as it was well known that any offspring of a sage, especially one who had performed many penances and austerities, would command powers greater than those wielded by the devas (or celestial beings). In due course their marriage produced three sons, Surapadman, Singhamukhan and Taraskasuran, and a daughter Ajamukhi. Kashyapar, as a rishi, tried to teach them to life a virtuous and righteous life, one that would lead to true knowledge, awareness and bliss. However, Mayai openly scorned Kashyapar's teachings, and instructed her children that the material world was the sole reality, and power and wealth were of paramount importance. Kashyapar realized that his children were firmly ensnared within the web of trickery spun by Mayai, and defeated and disillusioned he returned to the forest to resume his penance. Mayai now instructed her children to perform tapas. to Siva so that they might acquire the power which would enable them to subjugate the world and heavens. The three brothers successfully performed tapas of increasing severity, and as we have seen were granted various boons by Siva. They then returned to Mayai, and received further tuition from Sukacharya, the chief preceptor of the asuras, who taught them to live a brutal and sensual life. Armed with these powers, the brothers set out to conquer the world. Having vanquished and enslaved their opposition, they began their long reign. 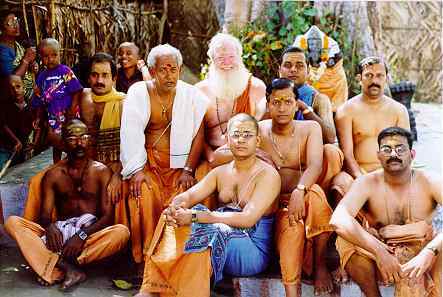 Their rule involved a complete inversion of cosmic order and was marked by injustice, torture, persecution, and a total disregard for the principles of dharma. The devas (angelic beings) weary of the intense suffering they had experienced under the misrule of the asuras, decided to rouse Siva from his meditations so that he would marry Parvati and produce a son who would destroy the asuras. Led by Brahma, Vishnu and Indra, the gods approached Siva to ask him for his aid to overturn the asuric kingdom. They found him seated with Parvati. The celestials recounted the many wicked deeds perpetrated by the asuras, and told of Surapadman's perverted and cruel rule. Siva promised the gods that he would provide his assistance. He sprouted five additional heads, and from each of his (now) six heads emitted a divine spark. The seed of Siva, fiery after long years of austerities was borne in agony by Vayu (god of wind) and Agni (god of fire) and deposited in the Ganges, which unable to withstand the extreme heat, transported it to Lake Saravana, a mystic body of water located in the Himalayas. Each of the sparks subsequently developed into a baby boy, and each was individually guarded and nurtured by one the six Pleiades maidens (Krttikas). At this point Parvati's anklet broke, and each of the nine jewels in her anklet reflected her image on this surface of the lake. As Siva's glance fell upon these saktis, each was impregnated. Each sakti produced a fully-grown son, who collectively were to provide the nine generals of Murugan's devonic army. The chief of these was Veerabahu, (individual wisdom and collective intelligence). The six babies, born of Siva's spark, rushed to Parvati who embraced them, so that they fused into one being, with six heads and twelve arms, the form of Murugan known as Shanmugan or Arumugan. Throughout his brief infancy Shanmugan displayed extraordinary talents. 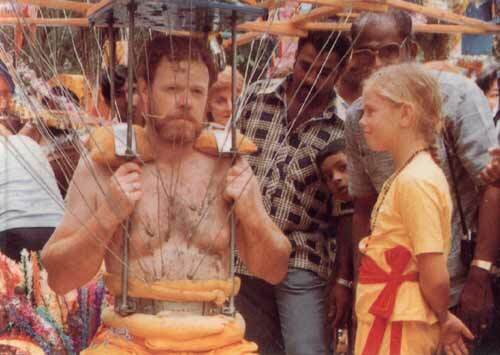 But his most celebrated childhood act was the imprisonment of Brahma. Brahma had refused to acknowledge Murugan's status as the son of Siva. Murugan, annoyed, had asked Brahma as series of questions regarding the inner meaning of the mystical symbol, the Pravana Aum. When Brahma could not answer, Murugan had him beaten and thrown into jail. Siva, alerted to this development, approached Shanmugan and playfully requested him to explain the significance of this sacred symbol. Dutifully, Murugan instructed his father in the mysteries of the Pravana Aum. After his boyhood, Murugan was presented with the Vel by Parvati. Accompanied by his generals and the devonic army, Murugan left Mt. Kailasa in the north of India to head southwards to combat the asuras. En route, Murugan encountered Kraunchan, a major asura, who attempted in the form of a mountain to block the passage of the devonic forces. Murugan destroyed Kraunchan with a single blow of his Vel. The battle between the devas and the asuras raged for six days and six nights, with both Surapadman and Murugan taking a limited role in the early conflicts. Ascendency alternated between the devas and the asuras during the course of this great struggle and neither was able to vanquish the other. However, whenever the devas appeared to be near defeat the intercession of Murugan assured that they regained the upper hand. Once the devanic forces began to control the course of the war, the asura Agnimukhan prayed to the goddess Bhadra Kali to intervene on the side of the asuras but upon encountering Veerabhu, Bhadra Kali merely smiled and withdrew from the battlefield. With the arrival of Murugan and Surapadman the final phase of the conflict commenced. Realizing the immense power of Murugan, and that a defeat in a straight fight was inevitable, Surapadman employed all the illusory powers he had been taught by Mayai, assuming the forms of objects, birds and animals. However, Murugan was beyond any delusion and quickly flushed Surapadman from each of his disguises. Towards the conclusion of the battle Murugan appeared before Surapadman in all his glory. Surapadman was temporarily overcome with Divine Love, but when Murugan resumed the form of Shanmugan (i.e. with six faces, twelves eyes), Surapadman converted himself into a massive cannibalistic monster with a thousand arms and a thousand legs, and launched a frenzied attack. Murugan split Surapadman in two with his Vel, whereupon the latter escaped into the ocean and became a gigantic mango tree which threatened to smother the world. Murugan cleft this tree with his Vel and Surapadman then took shape as a peacock and a rooster, both of which charged at Murugan. However the deity tamed both with a single loving glance. To commemorate the defeat of the asuras, Murugan ordered that the peacock and rooster should respectively become his mount (vahana) and emblem of his standard. Thus Surapadman's gift of immortality by Siva was recognized, and he became in the form of two birds, the transformed and submissive symbols of Murugan's dominance. On the metaphysical level, the mythology of Murugan may be seen as an extended metaphor for the processes of spiritual evolution; i.e. the destiny of the soul and its ultimate relationship with the Divine. Once an individual reaches a certain stage of spiritual awakening there is a desire to renounce superfluities, and to realize Truth. But in the struggle to achieve moksha (liberation), the devotee often remains unaware of the power of the negative forces of the world, and the magnetism which deluding joy can exercise. Kashyapar symbolizes this level of unfoldment: although he is a sage and wishes to experience enlightenment, he is attracted by and marries Mayai (lower nature). The union of the soul with avidya (ignorance of the essential Divine character of the soul) leads to the birth of ego consciousness (Surapadman), ego motivated desire (Singamukhan), ego motivated selfish actions (Taraskasuran) and veiling power, that which beguiles the soul and leads him/her to fall prey to transient and sensual desires (Ajamukhi). The advice given by the father Kashyapar to his children was to live a righteous life. However the credo of Mayai, supported by the asuras, was to exploit the illusionary material world. As has been shown, Surapadman and his siblings ignored the instructions of their father, and followed the pathway advocated by their mother. The wayward instructions provided by Mayai represent the inner conflicts, choices, and �pulls' experienced by the soul. The improper use of intelligence to acquire power seems to bestow upon the individual a certain strength, and he/she becomes corrupt, self-centred, forgets the Divine, and exploits his/her knowledge for selfish pursuits. Having been created by Siva in the image of the Divine (Sura), the soul falls into the grip of the lower nature (asura). The description of how Surapadman and his brothers petitioned Siva for certain boons, and their subsequent employment of God given powers for evil and unworthy ends, illustrates this process. The �birth' of Murugan is recognition of the yogic Grace extended by Siva. Shanmugan is created by the third eye of Siva, the eye of wisdom which is able to penetrate all illusion. The triumph of the asuras is ultimately based on Mayai's use of illusion, both as cause and effect, which is fundamental to her success. The Vel represents the highest power of Sakti (Para-Sakti), which when employed by Murugan, dispels all phenomenal illusion and allows the aspirant to see beyond the world created by Mayai (maya). Murugan's acquisition of the Vel represents the fusing of Jnana-Sakti of Siva (i.e. his absolute power of wisdom), and the Para-Sakti of Parvati, to form Yoga-Sakti (contemplative knowledge). Murugan with his Vel is thus identified as the pursuit of the pure spiritual knowledge, which destroys the asuras or impurities within the devotee. In essence, Murugan may be thus perceived as the principle of Siva-Sakti's action within the substance of the mind. This is further illustrated by the actual sequence of events surrounding the �birth' of Murugan. As we have noted, the divine sparks emanating from Siva's third eye and borne by Vayu (wind) and Agni (fire) to the Ganga which carried them to a lake (Saravana Poihai, or the pond of Saravana). The depositing of the energy (teja) of effulgence in the world involves a combination of the five principles of creation: ether, air, fire, water and earth. Parvati's embrace of the six babies creates a Being with a single body and six faces. Satki as the dynamic force of the universe thus integrates the Spirit which was six into one, Skanda (the United One), conjoining the Divine Light (Siva) and Life (Sakti), superficially diverse but experienced by the Yogi in essential Oneness. The consignment of the sparks within the divine lake may be seen in terms of the creation of the human soul and the provision of the conditions for its spiritual evolution. The lake itself is thus the human complex, whereas the reeds within the Saravan Poihai represent the web of nerves in the human physical body, the network of life currents known as the nadis in the vital body, and the thought flows in the astral body. Psychically, the nadis become the battleground within the human complex in which the inner war between the devas and the asuras is fought. In this sense the Vel and Murugan constitute the essential paradigm for spiritual evolution and the attainment of moksha. For in contemplating the animating life energies with which he/she is composed (Sakti-Becoming), the aspirant is led to the discovery of his/her true divine nature (Siva-Absolute) and thus into recognition of the intrinsic unity of all existence. Thus the individual (microcosm) is linked to the universal (macrocosm), and is possessed of the full knowledge of the cosmic union of Siva-Sakti, the duality of oneness in perfect dynamic balance. the necessity for Divine Grace (arul) to remove him/her from the pull of lower urges, and to develop willpower and cognition. Divine Grace will often be bestowed in the form of a Guru. In the initial stages of spiritual unfoldment the devotee is sustained by powerful emotional forces, which generate a seemingly invincible supply of willpower. This gathering resolution is symbolized by the destruction of Kraunchan, who takes the form of a mountain, and who represents inertia, laziness, sloth and a crude effort to fulfill instinctive urges. At this juncture it appears only a matter of time before the lower forces are routed, and the untroubled mind is permanently installed in the higher cakras or spheres of spiritual energy. But the fervour generated by the emotions is not durable, and in time the mind will deviate to the urging of the lower cakras. The devotee is able to call upon two forces in his fight to banish ego-dominated ignorance: Discriminative Intelligence (Veerabahu) and Universal Wisdom (Murugan). The early stages of the battle are fought by Discriminative Intelligence, but at all times the devotee is subject to counter attack by asuric forces. The devonic and asuric forces operate from the same ground, (human consciousness), and employ the same vehicles (human intellect and senses) in mounting their �campaigns'. Whenever the asuras threaten to overwhelm the devotee, the Divine intercedes, ultimately weakening the ego. A major enemy of the devotee is the limiting sense of Time, and the belief that despite his/her efforts he/she is not making headway towards his/her final destination. The realization that Time is a product of human imagination is symbolized by the arrival on the battlefield of Bhadra Kali, the embodiment of Time, who is invited to intervene by the asura Agnimukhan (representing the abusive and loud mouthed crudity which displaces methodical knowledge). 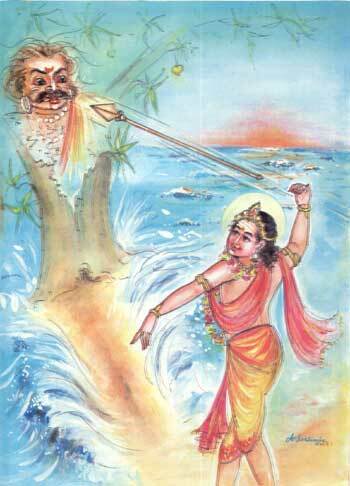 Upon meeting Veerabahu, the pure form of analytical wisdom, the goddess merely smiles and withdraws. Bhadra Kali can only be terrifying to those enfeebled by ignorance, but she relinquishes all power over those who have acquired the ageless knowledge which has liberated them from the grasp of Time's narrow constraints. But the major enemy remains the ego. As long as this continues to exist the devotee may be overwhelmed by ignorant and selfish desires. The final battle between Surapadman (ego) and Murugan (Universal Wisdom) represents the conclusive struggle to shatter the ego. Throughout this conflict Surapadman appears in many forms demonstrating the many delusions imposed upon awareness by the sense of ego. Each of these camouflages is uncovered by Universal Wisdom. The diversity of forms assumed by the Surapadman has a simple explanation. In the course of its evolution the soul has passed through many categories, such as inanimate matter, as well as vegetable, plant, tree, bird and animal life, before taking human form. The ego possesses residues of all these past lower existences. Thus as Murugan repeatedly flushes Surapadman from each of his many disguises, visible and invisible, so the soul is liberated from the remaining pull of the avidya (ignorance) of all of these former categories. As the ego is isolated and its power is gradually blunted, the aspirant gains a brief and fleeting vision of Lord Murugan, representing the Universal Wisdom he/she has been seeking. The ego makes one final attempt to reimpose its dominance, but has met Divine Grace, and is destroyed. The destruction of the ego is explicitly symbolized in the form of Surapadman's final incarnations. Towards the conclusion of the battle the asura becomes a tree. However it instructive that this is a mango tree, and that and Surapadman seeks refuge in the ocean. Both trees and mangos may symbolize the power of Sakti; trees often represent procreation avid fertility, and mangos may signify desire and lust, while water is the element of sakti, and the oceans are the ultimate earthly expression of water's power. Surapadman's attempt to take the shape of a mango tree within the ocean, a tree that seeks to smother the world, may thus be seen as the final dramatic determination of the ego to assert full control, and to obliterate all spirituality. 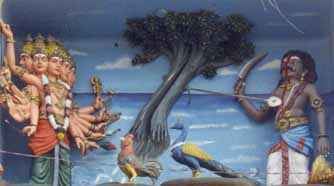 The splitting of the tree produces two birds��the rooster and the peacock��which both attack Murugan. In classical Tamil the term maram also signifies an individual full of anava or ego. The two properties which in combination form anava are yām (or the �I' of individual assertion), and ennathu (denoting the possessive self). Yām is symbolized in the form of a rooster as it struts around with its chest puffed out, while ennathu is seen in the vanity of the peacock as it spreads its feathers. Just as Murugan tames both birds with a single loving glance, and incorporates one as his standard and employs the other as his mount, so he first subdues anava and transforms the lower forces of yām and ennathu into pure awareness, so that the soul is forever bound close to him in grace and love. All major events in Murugan's cosmic history are commemorated in great festivals which prescribe specific forms of ritual worship appropriate to the occasion. The campaign which resulted in Murugan's defeat of Surapadman is celebrated in the six day festival of Skanda Shasti (also known as Kantha Shasti) in the Tamil month of Aippaci (October-November), while Parvati's bestowal of the Sakti Vel is commemorated on or near the full moon day in the month of Tai (January-February).